Gliding soundlessly over the surface of the sea in a kayak is a strong nature experience. Old or young, experienced or beginner – kayaking is something everyone can enjoy starting from the first paddle stroke. 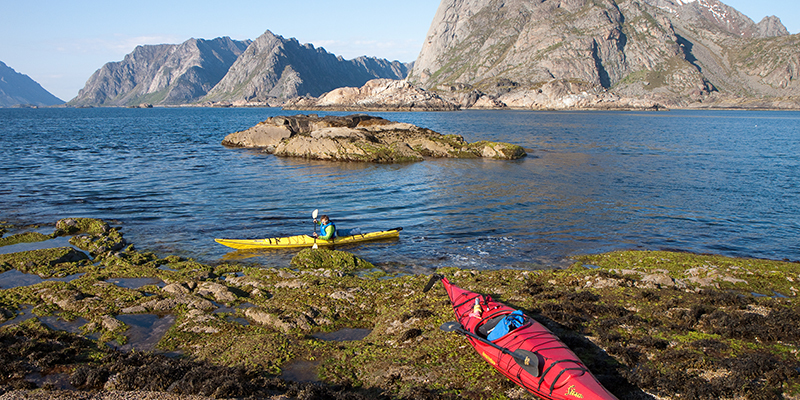 There are great places for kayaking all along the Norwegian coast line. You can hardly get closer to the water’s surface, and since the keel on a kayak does not go deep at all, you can paddle in to shallow areas where it is not possible to go with boats. Without a noisy motor you will not disturb the wild life, and if you are lucky you will witness a porpoise coming to the surface for air, or a curious seal following you in the water. Paddling out to an islet to make camp is a wonderful outdoors experience. Bring some wine, light up a camp fire and enjoy the sunset with some good friends. Paddling out to an islet to make camp is a wonderful outdoors experience. Kayaks were traditionally used by the Greenland Inuit for hunting and fishing. Their kayaks were built with a frame of wood or bone that was then covered with seal skin. Modern kayaks are usually made of plastic, fiberglass or carbon. 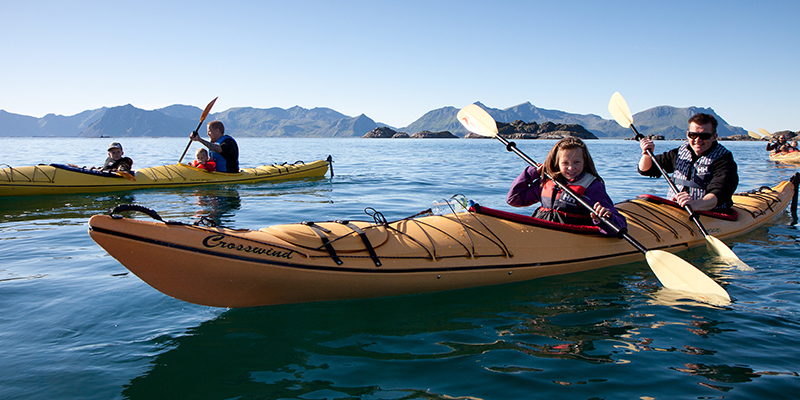 There are several different types of kayaks, out of which the sea kayak is constructed for use on the open sea. The sea kayak can withstand high seas, has a waterproof bulkhead and cargo compartments for camping equipment, food, etc. Kayaking is an activity that most everyone can engage in. A new-beginner will quickly achieve some mastery, and for those who have been in the game for a while, there are always new challenges to meet. As you acquire the sense of security and skills, you will be able to surf the waves and feel your adrenaline kick in. Calm paddling on serene waters on a warm summer day is almost like a form of meditation. Kayaking is also a fun activity for families, and if you are secure in your skills you can bring along children as young as 3-4 years of age if you have a double kayak. When paddling a kayak the muscles you need the most are your abdomen, back and shoulders. If you bend your elbow and stiffen your arms you will get a rotating movement in your upper body started. The large muscle groups are the ones that should do the work. Try not to put too much pressure on the biceps, they will soon pray for you to stop! Also avoid pushing the paddle blade too deep into the water, as this will have a slowing effect instead of gaining more speed. You can go kayaking all year round as long as your equipment is in order. During the winter a proper dry-suit is absolutely necessary, and something you should consider also during other seasons. The water is almost always cold in Norway, and even though it may be +20 degrees in the air, you can quickly reach hypothermia if you should be so unlucky as to capsize the kayak and end up in the sea. It is important for you to learn self-rescue and rescue of others, and to rehearse this regularly. Weather, wind, storms, waves, boat traffic and fog are factors you need to constantly take into consideration when you are out kayaking. For security reasons it is recommended that you always go kayaking together with someone else. It is important for you to learn self-rescue and rescue of others, and to rehearse this regularly. Exercise caution and be conscious of your own limitations. The Norwegian Kayaking Association offers several courses around the country, and if you are a newbie, you should take a course to get the so-called “wet-card”. If you want to rent a kayak in Norway, you will need this “wet-card” at most places. The card proves that you have been through basic safety training including rescue rehearsal. There are well over 100 registered kayaking associations in the country, and many of these offer training and have set kayaking days and gatherings where you can get to know the like-minded. Sea kayaks come in different shapes and are made out of several types of materials. Generally speaking it could be said that a heavy plastic vessel that sits steadily in the water is a good choice for a beginner, or for those who want their kayak to withstand heavy handling. If you want to paddle longer distances or use the vessel for exercise, a narrower and lighter kayak made from fiber glass, carbon or Kevlar will be a better choice. These kayaks are a lot faster, but also more unsteady and therefore require greater skills to operate. Kayaks made from these light materials are also more fragile and must be treated with more care than plastic kayaks. Kayaking is suitable for people of all ages and at all levels of experience. In addition to a kayak, paddles and kayaking clothes you will need safety equipment such as a throw-line, a pump, a paddle float etc. Different varieties of neoprene or a dry-suit are good choices for kayaking clothes. You can go kayaking all year round as long as you have the right equipment. You need a so-called “wet-card” issued by the Norwegian Kayaking Association to rent a kayak in Norway. Kayaking is a great work-out especially for the abdomen, back and shoulders. Kayaking provides fantastic nature experiences and is a good way to relax mentally. Beginners progress quickly in their skills, and there are endless challenges for both newbies and for the more experienced. Kayaks are made of everything from solid plastic to medium-light fiberglass to super-light carbon and Kevlar. Generally the lighter the kayak, the higher the price. Wind, currents, waves, boat traffic and fog are some of the factors you need to take into consideration when you are out kayaking.